Locals stumped about the best way to poach a salmon, how long to bake a stuffed pepper or how to cook a rib roast have a ready expert to consult: Lorain Arruabarrena, the lone female staffer behind Mollie Stone’s meat and fish counter at 2435 California Street, near Fillmore. 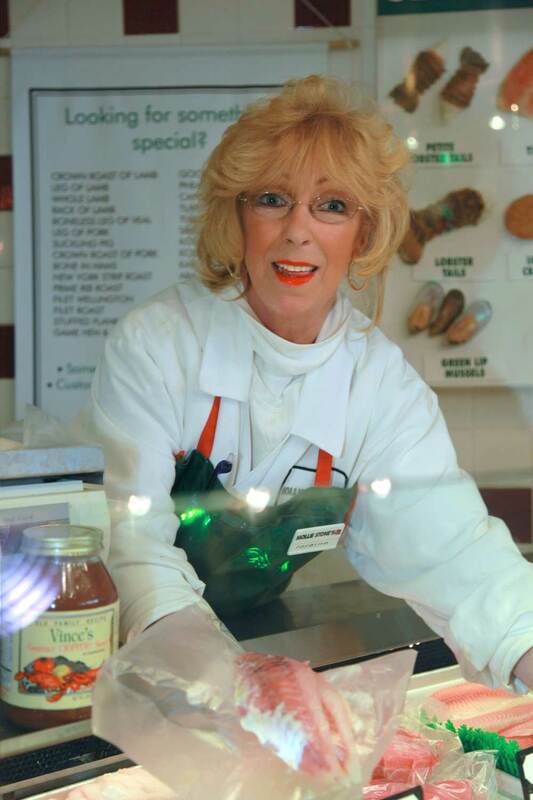 The meat maven, who also serves as mother figure and mentor to the younger men behind the counter, has clocked more than 30 years in the butchering business — including stretches at Petrini’s, Enrico’s and the neighborhood’s Grand Central Market, which morphed into Mollie Stone’s a decade ago. Before becoming an apprentice meatcutter, she had some stints in retail. And back in the 60s, she was a carhop at Mel’s, where she recalls serving deep dish berry pie to Joe DiMaggio and his mom nearly every Thursday. The thrill of the hunt has endured. Now her hunting companions include her brother and son. She remains the only female member of the hunting club she joined in 1956, when she was five years old. The group of two dozen or so — some of them fourth generation — meets in Middletown, up in Lake County for hunting season in August and September each year. They hunt and camp and feed on lavish banquets under the stars. Cellphones are strictly banned. “I love to hunt deer and rabbit. That’s it — no ducks or other birds,” she says. And the frequent forays into the woods and mountains surrounded by bears, mountain lions, bobcats and more have also made her an authority on all kinds of wildlife. “Here’s something most people don’t know,” she offers. “If you ever kill a rattlesnake, the best thing to do is to chop off its head, dig a hole and bury it. Otherwise, the yellow jackets will come to feed off the snake and eat the venom — which can then seriously hurt you if you get stung.” She learned this tip from her uncle, who learned it the hard way. Nothing from her hunting hobby goes to waste. Her home is adorned with a mounted rattlesnake skin, a stuffed bobcat and a few deer heads. “I cook a lot,” says Lorain, who is known for giving away plates of her culinary creations to neighbors and family. She says co-workers — particularly some of the guys behind the meat counter — have come to depend on her expertise with chops and roasts. A rabid 49ers fan, Lorain also has a number of softer, gentler pastimes beyond wielding knives and guns. She decorates gift baskets and boxes for friends and relatives on special occasions, adorning them with flowers and ribbons and meaningful pictures. She also has a regular bevy of animals — currently three dogs and a cat — and takes special pride in her garden. She’s 60, but says she’s far from thinking about retirement. “I like the industry too much,” she says. And business seems to be booming. Lorain says that in addition to the regulars from the neighborhood, the store has picked up new customers since the Cala Foods at Hyde and California closed a few months ago.